Elliebelly Knit & Dye Works > Blog > Knitting > Knitting with Dragons. Color Choices. Why I Knit. Knitting with Dragons. Color Choices. Why I Knit. Drachenfels, which means Dragon Cliffs in German, is also a wonderful pattern by Melanie Berg for a multi-colored, knit shawl. My plan is to knit it with sport-weight cashmere from The Plucky Knitter. The issue? Color selection. I have some choices ahead. Choice One: the blue color is Thank You Note, and truth be told, it is probably my all time favorite color. The green is called Good Old Days, and the first time I saw it, I wondered who could possibly like it. The answer is me. I've got a hat on my needles in it, a sweater in a related shade in progress, and plans to do another sweater (because I want a pullover in this color in addition to the cardigan I'm knitting). I adore it, and although as a kid I was told I couldn't wear green, this one works for me. And gray. Because I love gray. Choice Two: It's hard to capture the depth of this teal blue-green. It's the same color as the Olivia I currently have in progress, which I've also been unable to get an accurate color photo of. Choice Three: I am not a colorful person. But I could be, especially if I knit Drachenfels up like this! Choice Four: Ignore Thank You Note on the left, and focus on the delicious introduction of Cabernet, the red, with the pink (Decorum Dictates) and the light gray. This one might be impossible to resist. Choice Five: My original thought was to go with the two grays and the scummy green. But the contrast wasn't high enough. Then Decorum Dictates, the blush pink, dropped into my lap while they were out. The three on the left — pink, gray, and green. Choice Six: Another strong contender (ok, they are all strong contenders or we wouldn't be having this wishy-washy post), I originally thought about doing this is the red and grays combination, and this is the yarn I ordered for Drachenfels. And I still love it. I love them all. I think they would all be splendid. So, I'm having a hard time deciding. Choice Seven: Finally, there is this lovely concoction of gray, blue, and red. It will look good with black, which is a must in my wardrobe. It is both unusual and familiarly comforting. I like it a lot. But then, as we have previously established, I like all of them. So help me out. Let me know what you like and why. What would be practical. What would be whimsical. Help me decide on colors for my Drachenfels, and consider joining me! Drachenfels has been knit 511 times on Ravelry (as of this posting) and in such a wide variety of yarns! This project pretty much sums up why I knit. Beautiful colors. Wonderful, soft fibers. Texture. The planning is as much fun as the knitting. The finished project will be surreal. Truly, I cannot wait! I vote for 1 & 5. Whichever colour combination you choose you will love it. I wear mine all the time. Thank you for the encouragement! Im in the middle of a bout of the flu, but hoping Im going to feel good enough today to go downstairs and find needles and cast on. Fortunately, Ive decided on choice five (thank you for your input on that!) and Ive already got one of the green skeins wound, so I wont have to fool with that to get started. I hope you feel better soon. I have a feeling that knitting Drachenfels with Plucky Yarn helps a little. Keep us posted on the progress. 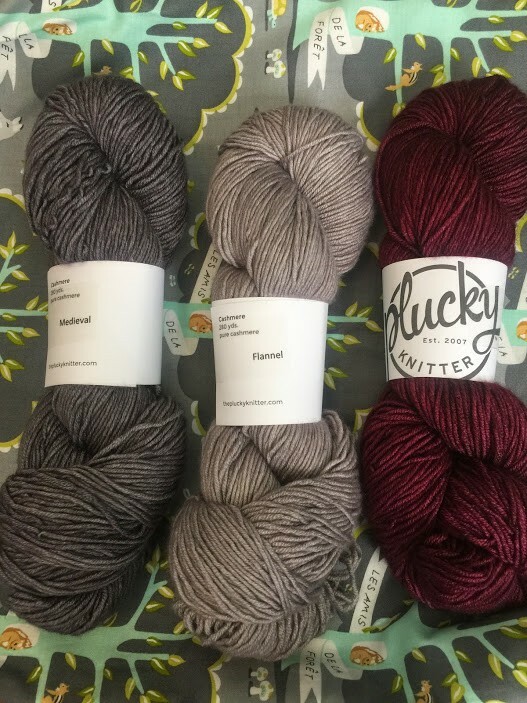 I think youre right — Plucky yarn is pretty much the cure for all ills. Im hoping to better better by evening and to cast on.